It’s one of those balmy, breezy days that occasionally crop up during a Southern California winter…the old French doors are open and the sun is shining in. A tease to make you yearn for summer, which I do quite often – it doesn’t take much. To counter this yearning, I thought I’d offer up some balmy, breezy, and very early highlife from Ghana. Boateng and his guitar-less group with his piano (possibly one of the first highlife groups to ever include a piano in their band? ), sax, and fiddle, recorded this and several other songs in Accra, ca. October 1937 for HMV. It’s got a swoony quality that I like. These are not common. 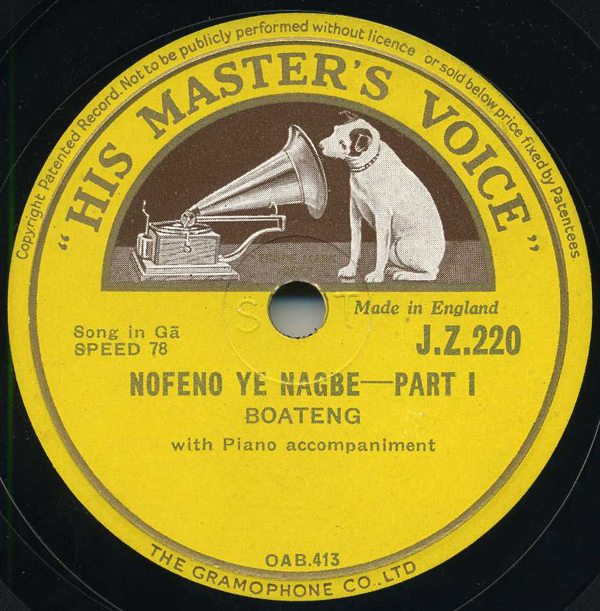 Under its sister label Zonophone, HMV had recorded over 500 records of West African music in the late-1920s. However, financial collapse within the recording industry during the Depression caused a 6 year gap in West African recording by HMV. They returned with gusto in 1937 however, with a whole variety of number series’ (including this one, the JZ series) for export to West Africa. Geek talk: despite that my copy of this record is in “New” condition, there’s the issue of the 1930s HMV pressing, which can often be hideous. This is a prime example. I did my best to clean it up, which was not easy with my humble utilities, but I think it ultimately holds up. If you’re interested in more 1930s music from West Africa, definitely check out the fine work that Craig Taylor is doing over at Savannahphone. Thanks to Bill Dean-Myatt for details! awesome! you should do an African reissue set! balmy to the point of sounding like the shellac is drunk… beautiful!